For a whole week in early March each year schools across the country celebrate Doctor Suess, who has helped many kids learn to read, and also to love to read. We celebrate during this time period in honor of his birthday. It got me thinking, when my kids were served Green Eggs and Ham the other day at school, how much I always enjoyed those books myself when I was a kid. Then, I received a great little submission (see below) about how one mother really enjoys reading The Cat In The Hat with her child, and I thought, I would love to hear what everyone's favorite Doctor Suess books are to read with their kids, and why. In our house we have what we call the old standbys of the Suess books. Here are our personal favorites. We have read all these many times. For example, we always dig out Dr. Suess's How The Grinch Stole Christmas around November 1st and keep reading it until after Christmas is over each year. Also, once each child knows the alphabet and is in the early stages of reading several of these books, especially Cat in the Hat and Green Eggs and Ham get into heavy rotation, since they are such great beginner books to help the kids really "get" reading. Every once in a while though my kids will bring home from the library what, to me, is a new Doctor Suess book. I know it really isn't new, but I personally never read it as a kid and didn't know about it. One of those, for example, is One Fish Two Fish Red Fish Blue Fish. Yes, apparently I lived under a rock when I was a child, and didn't read this book. My kids really love it though, and actually it is yet another great book for very early readers. OK, so my point is that I would love to hear from you to share what Doctor Suess books are your favorites to read with your children. Which ones do they like to read over and over and over again with you? You can share your favorites here, of Suess books, or any books for that matter. 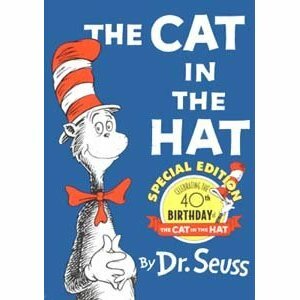 As I collect recommendations I will add them below, like this first one about The Cat And The Hat. Join in and write your own page! It's easy to do. How? Simply click here to return to best books for children. I asked people to share what they think are the best books for children, and this is a response I received. Here in Mexico we are not that familiar with Dr. Seuss. I knew about him but never bought a book from him. Last December I bought my kids The Cat in the Hat , which is a classic, and they LOVE IT! Even my 1 year old little girl asks me to read it to her with a cute " 'Ca', mama". It has a nice, easy, short and funny story and a very catchy rhythm. In my case, it works in two senses: encouraging the habit of reading and practicing English (BTW, forgive mine). My kids love Dr. Suess too, and The Cat In The Hat is a favorite, especially for the littlest ones. Something about the rhyming, and those mischevious Things 1 and 2 that get them giggling. So, what are your favorite Dr. Suess books for kids? I would love to expand this page further, with lots of opinions, so please share yours here, telling me your children's favorite Dr. Suess books, or any other books you have discovered for kids, and really love. My daughter has shared one of her favorite Doctor Suess books, and written a review. The Lorax is a story about a Lorax that speaks for the trees and a Ons-ler that cuts down the trees to make thneeds. When the Ons-ler cuts down the trees the swommee-swans and Bar-ba loots have to leave. I like this story because the Lorax and the Ons-ler fight about the rights and wrongs for the land. 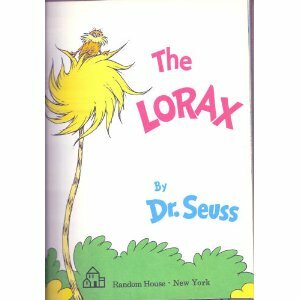 The Lorax is right because when the trees are gone the animals that lived there can't live there either, and they lost their habitat. The moral of the story is to be careful about how you treat the environment, and don't pollute the land. Thanks sweetie for sharing your review. Does anyone else have a favorite Doctor Suess book they like to read with their kids, or that their kids ask for over and over? If so, you can share your reviews here.